S533, Brown Color, Scroll Invitations, Jewish Invitations, Box Scrolls, High End Scrolls, Fabric Scrolls. Yet another beautiful invitation! 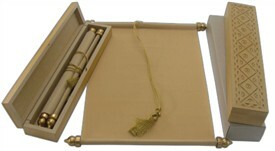 Exquisitely hand crafted and engraved by Artisans, this beautiful wooden box holds the velvet scroll. 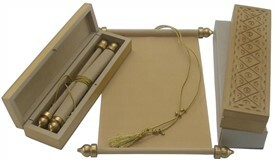 Matching tassel and golden knobs add to the beauty of the scroll. Brown cardboard paper mailing box envelope. 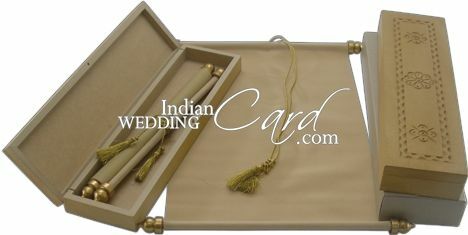 Wooden Box, Velvet scroll and brown cardboard paper mailing box envelope.